Pond aeration is one of the most important things you do for your pond! If you�ve ever asked the question of why exactly you have a pump pushing water over a waterfall, the answer is simply that it is keeping your fish alive. One can not have enough aeration. The Koi thrive better, bacteria in bio-filter are healthier! By increasing the "Oxygen" levels in the pond water, it will promote an overall healthier pond. One important area that higher levels of oxygen saturation help is in better promotion of good biological bacteria known as aerobic bacteria. Aerobic bacteria are the good bacteria in our pond that like oxygen. They grow and eat dead decaying plants, algae and pond muck up to 30 times faster than anaerobic bacteria (an-aerobic). Anaerobic bacteria live and grow in the absence of oxygen. Maintaining a constant supply of oxygen greatly improves the ability for the aerobic bacteria to thrive and keep your pond cleaner, the water clearer and fish healthier. It is a common belief that having pond plants will aid in providing oxygen to the fish. This is true, however, during the night, the plants use oxygen too. If you have too many plants, you’re taking away the oxygen the fish are using. Although a pond aerator will help with this problem, it is good to manage how many plants you have feeding off the water. Ponds that are designed with bottom drains permit better oxygen disbursement towards the bottom because water usually enters the pond's top surface and is drawn out from the bottom drain. This method recirculates the pond's total water column better than those that do not draw the water from the bottom. More oxygen content close to the bottom promotes the good bacteria which consumes waste that settles on the bottom, oxygen is a great oxidizer in itself! Decaying plants/debris/uneaten food in a very low oxygen level pond can create a toxic dissolved gas known as Hydrogen Sulfide. Hydrogen Sulfide (H2S) is a gas that can form in aquatic gardens and ponds, when certain bacteria feed on organic debris in areas of the pond that are low or depleted in oxygen. The most common way to detect H2S is by a rotten egg odor that may bubble out of the water when bottom sediment is stirred-up while seining fish, planting, or conducting general maintenance. H2S may be more prevalent in ponds and aquatic gardens that have been established for several years and have been heavily stocked with aquatic plants and animals. This is because organic debris accumulates on the bottom sediment surface, preventing oxygen to diffuse into the pond bottom. Aquatic gardens require that you drain and clean them on a yearly bases for the reason of removing dead decaying debris trapped in rocks, nooks and cranny's. 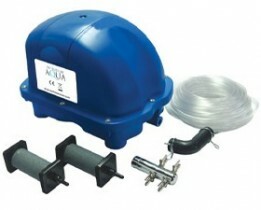 As there is no bottom drain and as a rule only a skimmer unit with pump. This allows debris to settle to bottom and not be caught in a flowing water column to be removed from system. One way to improve this is to add a Air Diffuser to pond or air stones placed in various locations. You will need a outside air pump to perform these steps. This will cause a water column to start drawing bottom water to surface for gas exchange.